The Albanian correspondent in Belgrade, Idro Seferi, revealed that the Serbian President Aleksandar Vucic often speaks in the Albanian language with him. 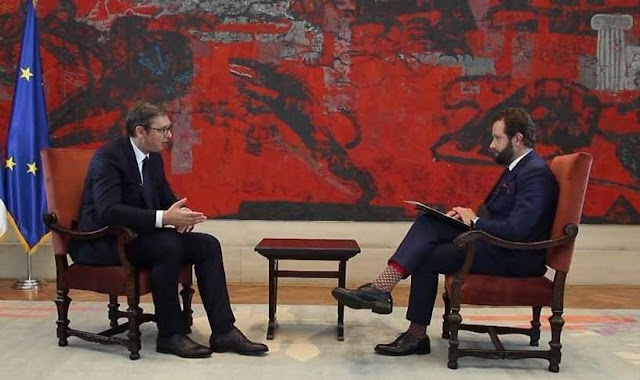 "Very often, President Vucic at press conferences interacts with journalists, and especially when he speaks about Kosovo, he likes to use words in Albanian and asks me if "is this good" and I say "yes", said Seferi in the show 'Info Magazine' in Klan Kosova. "Vucic also does not spells 'Ferizaj' in Serbian, Urosevac, but in Albanian trying to show that he knows the situation," says Seferi. Sefer shared with the viewer another question that he addressed to Serbian Foreign Minister Ivica Dacic for Kosovo. "I asked him when he would stop lobbing against Kosovo's independence and he told me when 'Albania will stop lobbying for Kosovo's independence," he concluded.